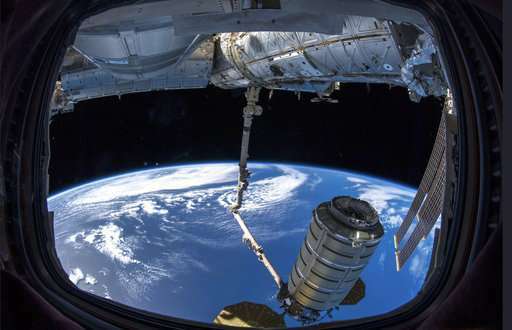 Roscosmos director Dmitry Rogozin and Bill Gerstenmaier, head of NASA's human explorations and operations, said after a conference marking the 20th anniversary of the International Space Station that their agencies plan to collaborate on developing a moon orbiting outpost. "We absolutely trust each other, and political winds haven't touched us," he said. Gerstenmaier spoke in kind, noting that space exploration "has driven us together" as effective partners that could "be an example to the outside world. "It has been a blessing that our governments have both seen the wisdom of what we are doing and both our governments have avoided placing sanctions on us or getting us caught up in the political things," the NASA official said. Ties between Washington and Moscow have been strained by allegations of Russian meddling in the 2016 U.S. presidential election, as well as by Russia's military role in Ukraine and Syria. "We never accused the Americans," he said Monday, blaming the media for inaccurately interpreting his statements. "We categorically deny such allegations." The tiny hole created a slight loss of pressure, but both Russian and U.S. space officials said it didn't pose a safety risk. The crew quickly patched it. Rogozin said an ongoing probe will determine the cause. Roscosmos and NASA agreed to not comment further pending the review's outcome, he said. "Human space flight is very unique in the fact that it requires absolute trust between each other," Gerstenmaier said. "To make this work, we have to be totally honest with each other, we have to be totally transparent with each other." "It's not easy keeping our crew safe on board the space station. It's not easy keeping the space station operational and functional," he said. "By having the heads of agencies get together and talk and describe these things, it actually results in a safer environment for our crews."